We offer you here a glass of high-class forest honey made the beekeeper directly on the farm in the nice High Puster Valley. Real South Tyrolean honey is a natural product, accumulated and processed the bees and got the beekeeper. During years with forest national costume the bees collect the honeydew the young impulses of the extensive spruce forests of the High Puster Valley. The dark, brown to auburn honey contains a high portion in malt sugar and crystallises, therefore, often only after half a year. Forest honey has a spicy, typical and distinctive taste. Herb with expectorant and anti-inflammatory. Obtained the destillation of William pears. Mature fruits are harvested at the right moment and carefully processed before being destillated. To be served fresh. Chestnut honey 500 gr. - Plattner bee's court South Tyrol 12,55 EUR / 25,10 €/kg. Raspberry honey 500 gr. Plattner bee's court South Tyrol 11,35 EUR / 22,70 €/kg. Pollen 200 gr. 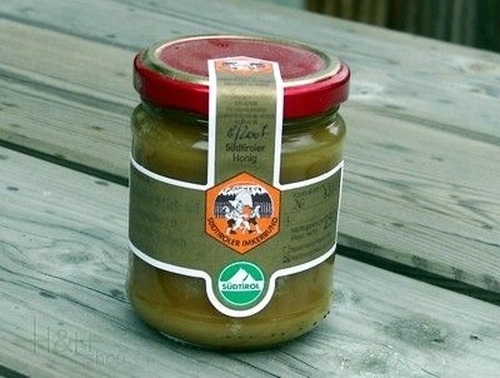 - Plattner bee's court South Tyrol 13,15 EUR / 6,58 €/100 gr. Acacia honey Organic 500 gr. - Plattner bee's court South Tyrol 13,15 EUR / 26,30 €/kg. Blossom honey 500 gr. Plattner bee's court South Tyrol 9,25 EUR / 18,50 €/kg. Lime honey Organic 500 gr. - Plattner bee's court South Tyrol 14,05 EUR / 28,10 €/kg. Blossom honey Organic 500 gr. Plattner bee's court South Tyrol 10,45 EUR / 20,90 €/kg.